We have a new and an enhanced version of the XML Sitemap Generator & Splitter extension now, and have discontinued support for the older extension. 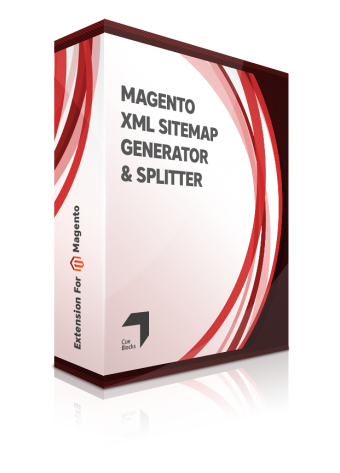 You can purchase the new 'XML Sitemap Plus Generator & Splitter' Magento extension from here. XML Sitemap Generator and Splitter is now compatible with the latest SUPEE-6788 patch as well. Please contact us if you have purchased the extension in the last 6 months and have installed the patch already. We have a more powerful XML Sitemap Generator & Splitter extension. Support for the older extension (on this page) has been discontinued. 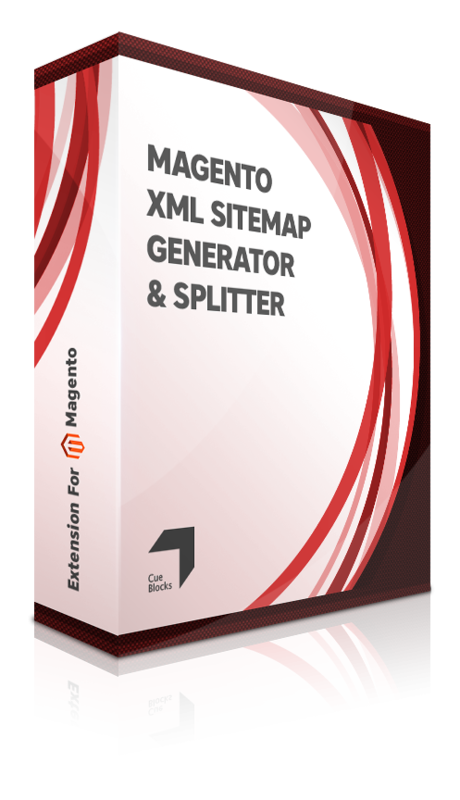 Buy this XML Sitemap Plus Generator & Splitter Magento extension instead. Why the New XML Sitemap Generator and Splitter Plus Extension should be your first choice! Empower your store with an improved and better XML Sitemap Generator and Splitter Magento extension from CueBlocks! The XML Sitemap Plus was launched, some time ago, to serve more purpose and generate more accurate sitemaps in less time than its predecessor. The upgraded version of the sitemap extension also features the functionality to generate mobile and image sitemaps. As expected, the Sitemap Plus has become hugely popular and satisfied many store owners, web masters and SEO experts alike. The upgraded version of the Magento extension is recommended for all new and upcoming eCommerce stores even with a catalog of more than 50,000 pages! Shift to XML Sitemap Generator and Splitter Plus for quick, diversified and easily indexed Sitemaps. A word from the wise: The older version is obsolete and is not recommended as much as the upgraded Plus version is. We will no longer provide support for the XML Sitemap Extension queries and suggest that store owners choose the Plus version for more efficient and search-engine friendly XML Sitemap generation or splitting and of course, for continuous support from our Magento Extension developers. XML Sitemap Generator & Splitter' is a complete XML Sitemap tool that generates and organizes your XML Sitemaps in compliance with the latest XML sitemaps protocol (followed by Search Engines including Google, Bing & Yahoo). 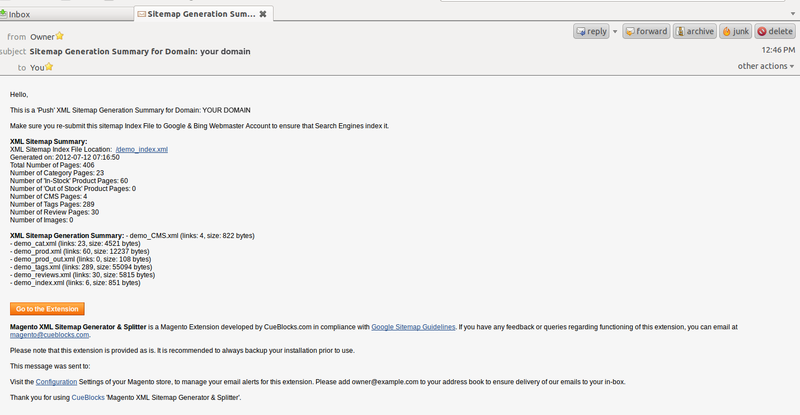 This is a specialist extension for generation & splitting of your XML Sitemaps, which Magento currently does not offer. The splitting of the XML sitemap is not just important for larger stores, with 50,000 URLs or more, but ALSO for smaller stores (with less than 50,000 URLs) to better organize their sitemaps and see what is being sent to Search Engines (via the XML sitemap files). - Properly create compliant XML Sitemaps, without having to spend too much time in doing this. - Know about the actual number of pages of different kinds, that form your XML Sitemaps and which get pushed into Search Engines. You can use this data to identify fluctuations in your store's number of pages, check this data against the actual number of pages indexed in Search Engines, identify from this number if you have a dramatic drop or increase in number of pages/traffic at any given date when the XML Sitemap was generated, and many other intelligent assessments. This extension will enable you to split the XML Sitemaps of your store easily (whether you have over 50,000 pages or not) and help Search Engines like Google, Bing/Yahoo to find content on your store. The maximum limit to which Google follows an XML sitemap is 50 MB size or 50,000 URLs for each sitemap. Thus if your store has more than 50,000 pages, this extension will automatically split your store's XML Sitemap into smaller Sitemaps and also create a sitemap index file, which will house all these sub-Sitemaps in it. Even if the total number of pages in your store are less than 50,000, this extension will create separate sitemap.xml files for the different 'types' of 'Magento controlled' pages on your store (eg. 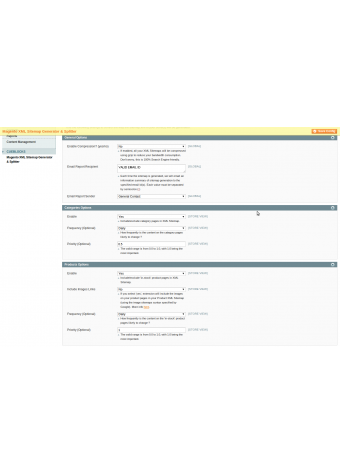 Category, product, reviews, tags, CMS pages). - Automatically generate and split your XML sitemaps. - Create a separate XML site for each 'type' of page on your store (whether you have more than 50k pages or less). - Get an email summary, as and when the sitemap is generated, of the actual number of pages that form part of each XML sitemap. This is very useful 'Store' and 'SEO' related data. Generate XML sitemap(s) for your Magento store. Automatically split your XML sitemap to smaller/sub XML Sitemaps, if the number of pages on your store are more than 50,000 or if the size is more than 50 MB. Automatically create a Sitemap 'Index' file which has all the multiple sitemap files listed in it. 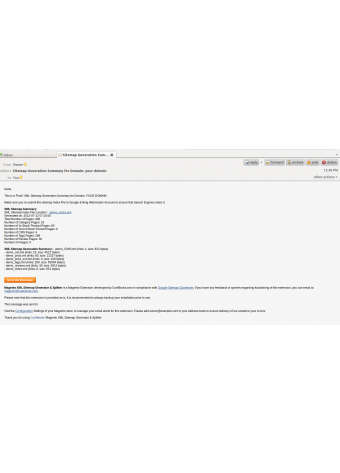 Include or exclude 'Out of Stock' Product Pages from your XML Sitemap. Exclude specific CMS pages (for example, Privacy, Contact etc) from the XML Sitemap. Generate separate Sitemaps for different Types of Magento controlled pages on your store (even if your total number of pages on the store is less than 50,000). Eg. Separate XML Sitemaps for product pages, category pages, CMS pages, Tag pages, review pages, Out of Stock pages etc. Control and automate the process of XML sitemap generation and updating. Get Sitemaps summary (number of specific pages & total pages on your store) in your inbox automatically each time the XML sitemap(s) is updated. Exclude canonical version of product pages. This extension enables you to only include one product page in your XML Sitemap even if it is in more than one category. Include the product page images on the product page, in Google's specified Product XML Sitemap format. Ping and notify all major search engines each time Sitemap is generated or updated. Compress your XML Sitemaps to reduce your bandwidth consumption. Step 1: Setup Extension Configuration. This first step is optional because we have set default configuration values on the setting page in a way that it fulfills most of your store's XML Sitemap requirements; but it's always good to check the configuration settings of the extension to know how the XML Sitemap will be generated. 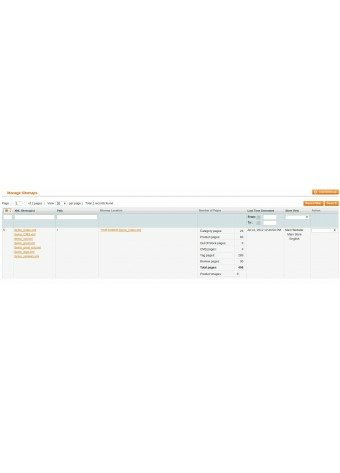 To go to the configuration page, from the Magento Admin Panel, go to System > Configuration. On the left navigation of this page, you will find 'Magento XML Sitemap Generator & Splitter', under CUEBLOCKS. 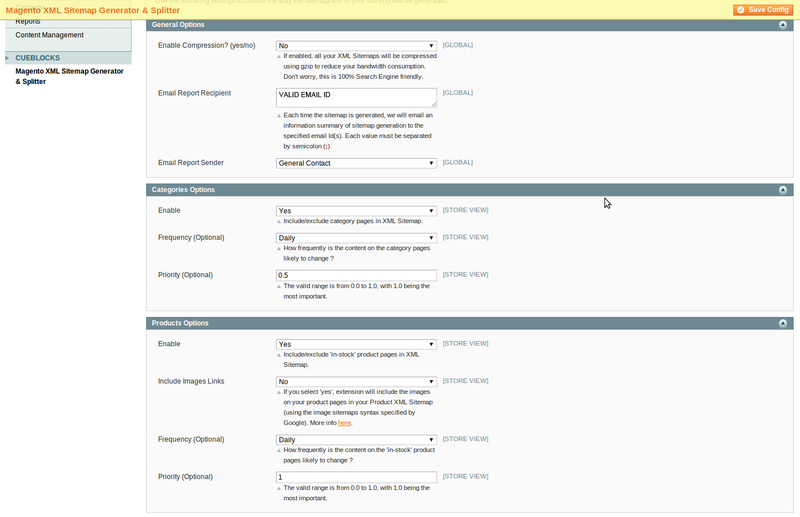 Set the extension configuration as per requirement. Make sure that you enter the email address(es), where you would like to receive Sitemap Summary each time sitemap is generated or updated. Step 2: Go to Add Sitemap. Go to manage sitemaps from Magento Admin Panel top navigation: Catalog > 'Magento XML Sitemap Generator & Splitter'. Click on 'Add Sitemap' button on the top-right hand corner of this screen.